UAE-based Gulf Craft along with its Australian dealer, Australian Superyachts, will showcase its family of yachts specifically designed for comfortable long-distance cruising at the upcoming Sydney International Boat Show. Gulf Craft will exhibit both the Majesty 122 (M/Y Ghost II) and the Nomad 65 during the 50th anniversary of the show which is set to take place from August 3 to 7 at the Cockle Bay Marina in the Sydney Exhibition Centre in Darling Harbour. 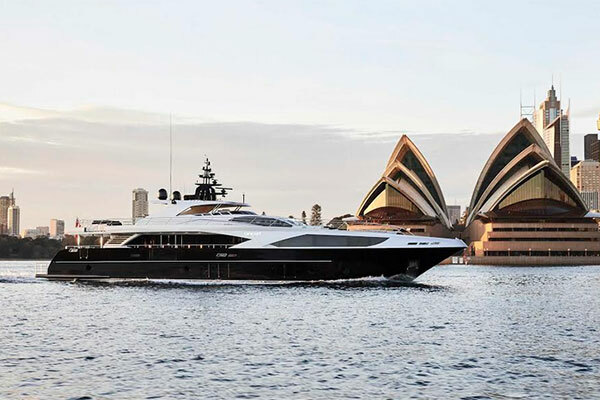 This year marks It is the first time the 37.5-metre Majesty 122 (M/Y Ghost II) is put on display, debuting as the biggest ever vessel to exhibit in the Sydney International Boat Show. “Australia’s market continues to grow in importance for Gulf Craft with an increase in the number of yachts and boats sold and delivered to the continent, emphasizing our position as builders for a global audience,” said Erwin Bamps, CEO of Gulf Craft. The Majesty 122 (M/Y Ghost II) was built specifically for the Australian charter market and adheres to Australian Maritime Safety Authority (AMSA) Class 2C, 1E and 1D Commercial Vessel Survey regulations. It combines long-distance capabilities with family friendly features, and sleek looks. The superyacht includes five ensuite staterooms, state-of-the art technology and engineering, a fully equipped galley, spacious interiors and offers panoramic views from its extended balcony. Also present is a garage large enough to house a Castoldi 16-foot tender and a jet ski. Following her Australian delivery late last year and having won three prestigious awards (Best Asian Built Yacht award at the 2015 Asia Pacific Boating Awards, the Best Yacht Installation award and the 2015 CEDIA Awards, and the Quality and Value Award at the 2016 World Superyacht Awards) scores of visitors are expected to drop by the Gulf Craft stand at the exhibition to experience the Majesty 122 (M/Y Ghost II) and Nomad 65. Also, at the show this year for a second time is the impressive Nomad 65. Coined “mini-explorer and “SUV of the Sea” mixing performance, functionality, and usability while focusing on passenger experience sets the Nomad 65 apart. Its main deck houses numerous amenities, while its roomy lounge and dining area enables those aboard to interact with the captain as they sit back and enjoy the water. “The Nomad 65 was extremely well received at last year’s show; it is an ideal fit for the Australian market which is why we’ve put it back on display again this year,” said Bamps.